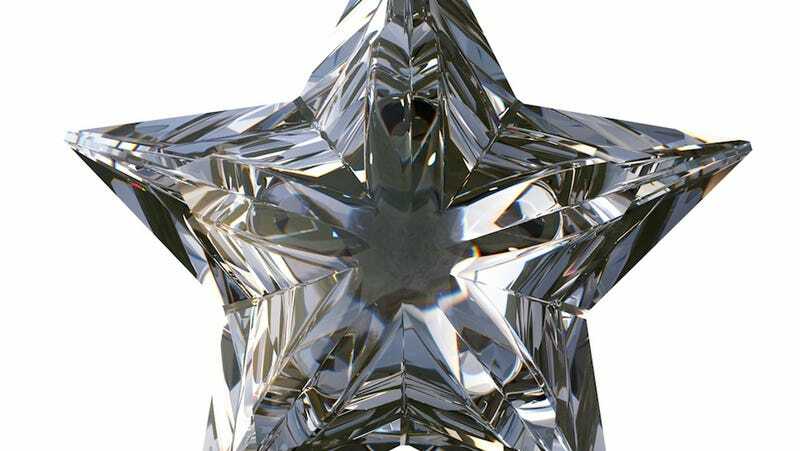 Not being well-versed in the sciences at all, it never even occurred to me that diamond stars are a thing. Yet according to scientists who actually know about these things, not only have they predicted diamond stars' existence, a team has actually discovered one! The star was once the size of our Sun, but it burned through its fuel, cooled and contracted into an Earth-sized object called a white dwarf, made of crystallized carbon. In other words, it became a star made of diamond. A team of scientists announced their discovery of the diamond star this week in The Astrophysical Journal. It is the coldest, faintest white dwarf star we know. "It's a really remarkable object," said David Kaplan, a professor at the University of Wisconsin-Milwaukee in a news release. "These things should be out there, but because they are so dim they are very hard to find." So cool. I say "latest one" because apparently a Yale team discovered one two years ago. Rest assured, Kanye won't rest until he can get a diamond star for Kim.